Whether your car is the victim of an errant shopping cart, a deranged key scratching jerk, a rock kicked up by a truck, or some other incident, paint scratches are unfortunately inevitable. 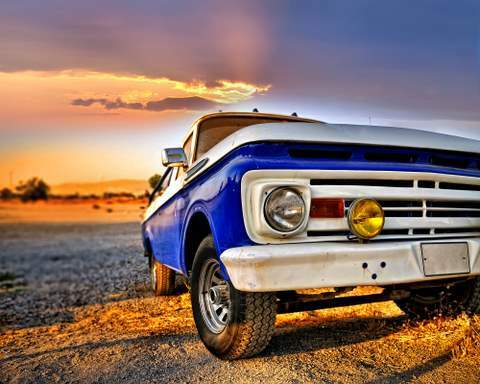 You could just skip repairing an auto scratch, but rust and ugly paint damage are probably things you want to avoid! An auto scratch repair service at an auto body shop can be very expensive, so we recommend doing it yourself with touch up paint. In this article we will show you how to fix your auto scratches with great results at the lowest cost possible. So you just got an auto scratch and need to fix it, or you are finally getting around to auto scratch repair. But how much does it cost to fix auto paint scratches? If you go to an auto body shop, you can expect to spend in the $300-$1,000 dollar range depending on how bad the paint scratch is. The reason auto body scratch repair is so expensive is that they typically re-paint the entire panel where the scratch is. The materials and time it takes a shop to fix a scratch really adds up quick. So is there a cheap auto scratch repair option? Touching up your scratched auto paint may seem daunting, but it is really quite simple, and will cost just a fraction of what the auto body shop charges. High quality auto scratch repair paint starts at less than $15, and can be used to repair multiple auto scratches. What other costs might you expect? For deep auto paint scratches, it may necessary to order a couple additional products like primer. If the scratch has gone through all the layers of your auto paint and bare metal is showing, you will need to use primer to get the touch up paint to stick. If your car has relatively small scratches or scuffs (smaller than the size of a pencil eraser), a touch up paint pen is the easiest and cheapest product to use. It has a felt tip which when depressed releases small amounts of auto paint. It really helps to practice with the paint pen before using it on your automobile. A smooth surface like a photograph or plastic container will help you get a feel for how the auto paint flows from the pen tip. When you are ready, make sure the scratched areas are clean and primed if necessary. Apply several thin layers with the auto scratch repair pen, letting each dry before applying the next. Finish with a couple clearcoat layers and polish with rubbing compound for a glossy finish. 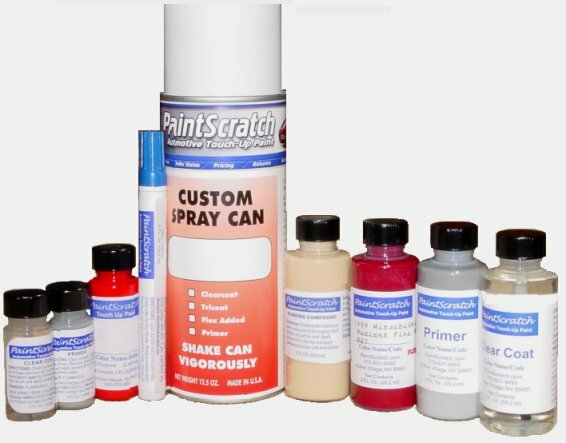 While the paint pen is easy and effective for smaller scratches, an auto scratch repair spray can is ideal for large and extensive scratches. With a spray can, you can do it like the pros and touch up whole panels at a time. 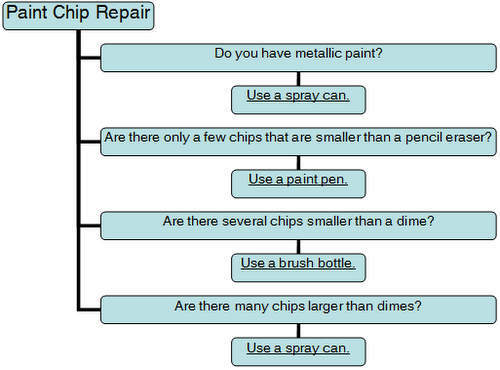 Spray paint cans are a little bit more expensive, but contain significantly more auto paint and repair larger areas. The brush bottles are good for scratches that are a little bigger than the size of a pencil eraser, but smaller than the size of a dime. Also if there are numerous scratches, the 2 ounce size will help you touch them all up. The auto scratch repair brush is quite simple to use: get a small amount of touch up paint on the tip of the brush and gently apply thin layers. You can find detailed touch up paint instructions, how to videos, and tips on PaintScratch.com. Just click the preceding links for additional help. You may be ready to get started today, or are just curious about the process and want to learn more. Our guided ordering system is designed based on helping hundreds of thousands of customers like you touch up their auto scratches. The first step is finding the touch up paint color that matches your automotive paint, and we’ll guide you through the rest of the auto scratch repair steps. 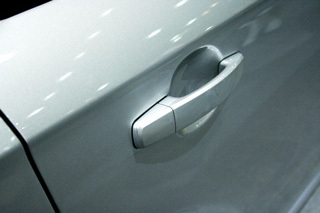 This article is meant to help you touch up your car scratches using automotive touch up paint. If you are reading this, you probably just got an unsightly scratch on your car’s paint. Like most people, you are probably not a scratch wizard or a bodywork specialist, but with a little guidance and good products you can do a great DIY car paint repair job. Maybe you need to fix slightly keyed car paint and are now in need of a small car scratch repair. Avoid spending hundreds of dollars at a shop for a car paint scratches removal service. You can easily fix minor car scratches with a touch up paint pen. Clean off the area using soapy water and then a wax & grease remover. Apply several coats of your paint color with the pen, letting it dry between coats. Next use clearcoat over the new paint. Finally, use rubbing compound (essentially car scratch polish) to polish the area so it is shiny. For more information about using paint pens, watch our touch up paint videos. If your car has a bunch of paint chips and you want to fix it, auto paint in a bottle is the way to go. The touch up paint bottles are 2 ounces in size, and are how to take off many scratches on a car. Follow the same guidelines for the touch up paint pen, except you will be using a brush rather than a pen tip for the car scratch repair. If your car has some serious paint scratches and chips, we advise using spray paint cans of touch up paint for the job. Spray cans are 12.5 ounces and can cover a large area of damaged paint. If your car is dented, you will want to order spot putty and some light weight autobody filler. You will use these products first before applying automotive paint with a spray can. If you get paint on your skin, remove it with a paint thinner then wash thoroughly with soap and water. Only use the paint pen on areas smaller than a pencil eraser. Practice applying touch up paint to a smooth surface before using it on your car. If something goes wrong and the paint drips on your car, use an automotive lacquer thinner to remove it and start over. Make sure to wear a respirator! For more thorough instructions and additional paint tips, suggestions, and tricks, see our touch up paint directions. Do it your self car scratch repair using automotive touch up paint is absolutely the best choice. You will save several hundred dollars and your car will come out looking great as long as you use high quality car paint, follow the instructions, and are patient (remember to let the paint dry between coats!). find your touch up paint color now.